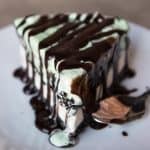 Grasshopper Ice Cream Pie is an insanely delicious (and easy!) dessert with a homemade Oreo crust and layers of vanilla ice cream, Oreo cookies, and mint chip ice cream. Then it gets drizzled with chocolate syrup for maximum chocolate effect! Finely crush 20 of the Oreo cookies in a food processor or by pounding them inside a large Ziploc bag with something heavy like a rolling pin until they are just crumbs with no large pieces remaining and have the appearance of course sand. It should be about 2 cups of crushed Oreos. Mix the crushed Oreos and melted butter in a medium bowl until they resemble wet sand, then press into the bottom of a pie dish, a 9- or 10-inch springform pan, or square baking dish. I find using the bottom of a clean glass works best for this. Bake for 8 minutes, then cool completely. When crust has completely cooled, pull both ice cream flavors from the freezer and allow them to soften slightly. Using a large spoon, scoop the vanilla ice cream out in large, flat chunks, and place them on top of the crust in the bottom of your pan. Cover the vanilla layer with a piece of plastic wrap and use your hands to press it down into a flat layer. The warmth of your hands will help smooth out the layer a bit. Discard the plastic wrap. Break up the 10 remaining Oreos into chunks, then sprinkle them evenly over the vanilla layer. Repeat the process of scooping ice cream in large flat chunks with the mint chip ice cream, pressing it down onto the layers of vanilla ice cream and Oreos until the top of the pie is flat. If you have more ice cream than fits in your pan, just mound it up in the center for a mile high ice cream pie. Cover with clean plastic wrap and freeze for 4-6 hours until the ice cream freezes solid again. Remove plastic wrap from the top of the ice cream pie and unmold from the springform pan (if using). Slice into 10-12 slices, then plate and drizzle each slice with chocolate syrup before serving. You can use either regular or mint Oreo cookies in your pie for you crust and between the layers of ice cream.